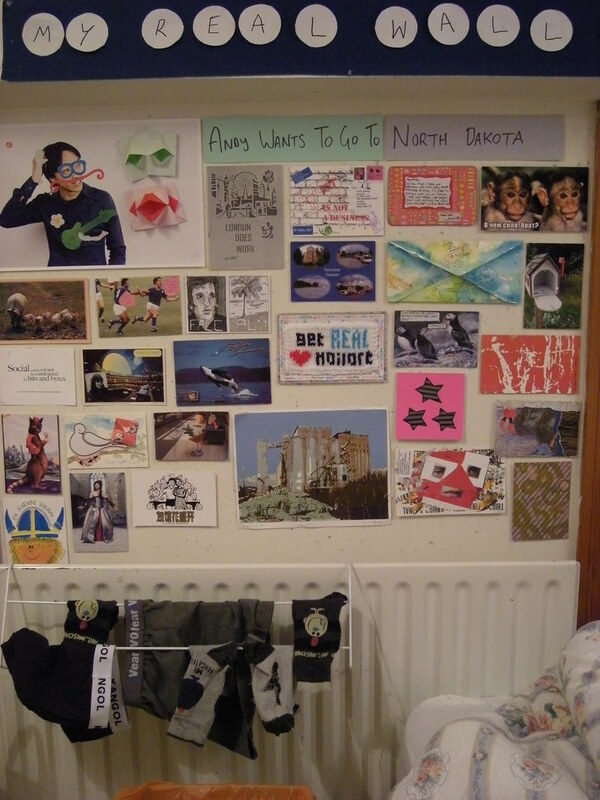 my REAL wall – 11 November 2009 – Retro Edition, originally uploaded by andytgeezer. Another popular social networking site on the internet is often criticised for changing it’s layout and not offering it’s users any option to do anything about it. Not here on my REAL wall folks! For those of you who haven’t liked the snazzy new upgrades (and what’s not to like about Okadascat‘s awesome knitted banner! ), today’s wall will be a breath of old stale air and you’ll love it! Today sees us return to the original slanted wall above the radiator, complete with my socks and underpants for those weirdos amongst you who enjoyed watching my weekly ritual of running out of clean undergarments. To accompany the return to the retro feel of the wall, I decided to dig out some old favourites and take you for a trip down memory lane. Hope all the older viewers enjoyed the trip down memory lane, and for those of you who haven’t seen the archives of my REAL wall yet, go take a look at them RIGHT NOW, then pick up a pen and paper and write to someone! The status update refers to a lovely email I received last night. In recent weeks, I have been told by a few art specialists that I am an "installation artist", which I graciously accept. I guess I never really viewed myself as an artist, but I suppose that my REAL wall can be considered a form of art in itself. As such it seems that my REAL wall has caught the attention of the people who work at the Plains Art Museum in North Dakota and someone from there emailed me last night to say that they were going to look into working on their own REAL wall there, based on my REAL wall! From being a chap who just wanted to get back in touch with REALity, to the giddy heights of artistic recognition by REAL artists and all in under a year, and it’s all thanks to you out there who keep sending me stuff! Thanks to everyone and keep watching your mailboxes! I'm sorry to burst your bubble but there is absolutely nothing 'retro' about those underpants! Whatever happened to the crusty cruds of yesteryear? I'm talking about those grey, stained Calvin Kleins that seemed to be a permanent feature of your radiator throughout February and March. What happened to them Elena? It's as if you bought the ones on show on today's REAL wall in Westfield at the weekend.